The Nicola Valley Health Care Auxiliary is comprised of passionate, caring, and dedicated volunteers. They are the driving force behind the Auxiliary and the work we do. We would like to give you a chance to get to know some of the amazing individuals who have been involved with the Auxiliary. These stories are of current and former volunteers. A dedicated group of volunteers, including current and former employees with School District 58, makes up the Nicola Valley Health Care Auxiliary’s Thrift Shop night crew. The group includes six members who come twice a week for two to three hours. ​One of the members, Joan, has been volunteering with the Auxiliary for the past 10 years. She has filled the Secretary position on the Auxiliary’s Executive and created the organization's website. Joan also started the Thrift Shop night crew. She’s currently an academic advisor with SCIDES, the distance education school in Merritt. 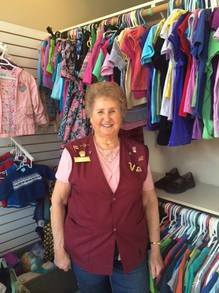 Another member, Vera, has also been volunteering for 10 years at the Thrift Shop. As a retired teacher of 30 years, Vera finds the hours and flexibility that the night crew provides a good fit for her. She is amazed by the donations that a small community such as Merritt, gives to the Thrift Shop. Corrine is another member of the Thrift Shop’s night crew and has been involved for almost 10 years. Similar to the other members, the flexible schedule works for her. She is newly retired from her former position as Registrar at SCIDES. Corrine has also volunteered for many other organizations in the community, including the Merritt Centennials and the Chamber of Commerce. Lee has been volunteering for 6 years at the Thrift Shop and her favourite part about volunteering is connecting with her friends and former colleagues. Prior to retiring from SD58, Lee was a Special Education Assistant. Susan has been volunteering with the Thrift Shop’s night crew for 3 years. She has been an avid shopper at the Thrift Shop since moving to Merritt in the early 90s. As a Grade 1 teacher at Bench Elementary, Susan has found the Thrift Shop to be a great place to find affordable children’s books, which she brings to her class to share with students. Shelley-Ann, another teacher with SD58, has been volunteering for almost 10 years at the Thrift Shop. She enjoys being a part of the Thrift Shop’s night crew, as she can give back to the community, while having fun and visiting with friends. At the end of a busy day, the night crew prepares the Thrift Shop for the next day, sorting through donations, displaying merchandize, and cleaning the shop. They work extremely hard to make sure the Thrift Shop is in order, providing support to the next day’s volunteer shift. Although volunteering behind the scenes and not during the Thrift Shop’s store hours, they have an invaluable role within the organization. The Auxiliary is very thankful for the dedication and countless volunteer hours that the night crew has given over the past decade! Lorna Valois has been a volunteer with the Nicola Valley Health Care Auxiliary for the past 20 years. Helping out at the Thrift Shop was Lorna’s first ever volunteer role, which she took on along with her mom and sister. She started by sorting, arranging merchandise, and running the cash register. She then took on a larger role, as Thrift Shop Convenor for a few years. In 2002, Lorna began doing payroll for the Auxiliary and in 2005 she took on the position of Treasurer. As the Treasurer, one of Lorna's tasks is to keep track of all funds raised at the Thrift Shop. Lorna has enjoyed this position, as she likes bookkeeping and working with numbers. Over time, she has seen an increase in funds raised at the Thrift Shop, which she believes is due to growing community support for the organization. In her position as Treasurer, Lorna also helps out with the Auxiliary’s summer student employment initiative. Professionally, Lorna has been an Early Childhood Educator for over nine years in Merritt. She works at a local daycare with 2 ½ - 4 year olds. Lorna also has six grandchildren of her own, who she enjoys spending time with. Lorna plans on continuing in her role as Treasurer and eventually, returning to the Thrift Shop to volunteer. Lorna's exceptional bookkeeping skills and dedication to the Auxiliary are greatly appreciated! Hiro Yasuda has been volunteering for the past 14 years with the Nicola Valley Health Care Auxiliary. She has filled many roles at the Thrift Shop, including her former role of arranging the window displays. Presently she displays merchandise and prices items at the shop. 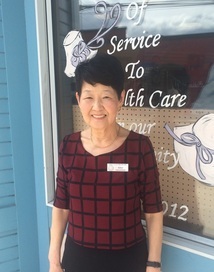 Prior to beginning her role as a volunteer, Hiro worked at the Nicola Valley Hospital and Health Centre in food service for over 20 years. Within this role she was responsible for planning and preparing meals for patients and staff. When Hiro retired she began volunteering at the Baillee House and shortly after, started volunteering for the Auxiliary as well. Hiro’s love for preparing food for others continued on after her retirement. She has prepared meals for Auxiliary events and is well known for her baked goods, which she brings almost every day when she volunteers at the Thrift Shop and Baillee House. Hiro hopes to see more community members visiting the Thrift Shop. In doing so, the community can reduce waste by purchasing previously used items, while supporting health care. She believes that the Thrift Shop is a great place for everyone. Volunteering is a special part of Hiro’s life. She feels that it gives her a lot of joy and the opportunity to interact, share, and learn. For Hiro, she is being her best when she can return her happiness to the public through volunteering. ​We are grateful for the many contributions that Hiro has made to the Nicola Valley Health Care Auxiliary and her continued commitment to volunteering. We are also thankful for the delicious baked goods that she prepares for us and the joy that she brings to the Thrift Shop! Volunteer story shared in April, 2016. Isabel Van Rossum has been a youth volunteer with the Nicola Valley Health Care Auxiliary for the past three years. She was in the process of looking to gain work experience, when her mom encouraged her to try volunteering. When she began at the Thrift Shop, she learned how to sort and price merchandise. Following that, she gained experience working with customers and handling the cash register. Volunteering at the Thrift Shop fits well with her schedule, as she is able to take shifts after school and on Saturdays. She believes that volunteering is valuable for youth, as it gives them an opportunity to give back to the community, gain experience, and work with great people. Another benefit of volunteering at the Thrift Shop for Isabel is that she gets to work with some of her friends, who are also youth volunteers. Her favourite activity at the Thrift Shop is sorting through the new donations that come in, as it’s always a surprise what’s in the box or bag. In addition to volunteering, Isabel enjoys sports, such as skiing and playing soccer. She also plays the alto saxophone in the band and trains with the track team at Merritt Secondary School. Isabel’s cheery personality and great customer services is greatly valued at the Thrift Shop. Volunteer story shared in March, 2016. Sandy Truman has been volunteering in thrift shops for 55 years. Her first volunteer role was in a church thrift shop in Burnaby and from there she started a lifetime of volunteerism. After moving to Merritt 16 years ago, she began volunteering with the Nicola Valley Health Care Auxiliary. She started at the hospital, providing televisions for patients, a role she filled for three years. Following this, she became a volunteer at the Thrift Shop. At the Thrift Shop, she has worked closely with the Auxiliary's youth volunteers, which has been a lot of fun for her. She has had the opportunity to watch them grow throughout their time as volunteers, seeing their skills and confidence develop. Sandy has belonged to Beta Sigma Phi, an international sorority group, for 55 years. She has also volunteered her time assisting seniors, taking them to medical and dental appointments, as well as bowling. Sandy recalls her mother telling her that the best gift you can give to anyone is to give your time and that is something she has done throughout her life. Her passion for volunteerism has been passed on to her daughter, who was a member of the Auxiliary for 5 years. Everyday at the Thrift Shop is an enjoyment for Sandy. She takes pleasure in working with her fellow volunteers and giving back to those in need in the community. We are thankful for Sandy's commitment and the passion she brings to her work at the Thrift Shop. Volunteer story shared in December, 2015. 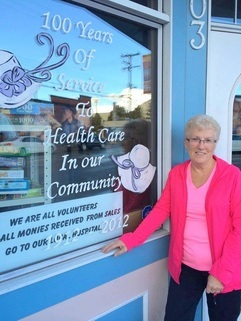 May Canil has been a member of the Nicola Valley Health Care Auxiliary for the past 10 years. Prior to her role with the Auxiliary she was a volunteer with Victim Services in Surrey, as well as in Merritt. For May, volunteering has been a good opportunity for her to get involved in the community. It has also allowed her to work with people, something that she greatly enjoys. She feels that the combination of familiar faces and those from out of town make volunteering at the Thrift Shop very interesting. Throughout her time as a volunteer with the Auxiliary, May filled the Thrift Shop Convenor position for 6 years. Currently, she runs the cash register and assists customers. She believes that the Auxiliary has many important roles within the community, such as providing low-cost clothing and household options at the Thrift Shop and raising money for much needed health care equipment. She hopes to see the Auxiliary expand in the future, allowing for more funds to be raised. In addition to volunteering, May enjoys flower gardening, fishing, and camping. We are very grateful for the dedication, kindness, and service that May provides at the Thrift Shop. Volunteer story shared in September, 2015. Mariya Johnson has been a volunteer with the Nicola Valley Health Care Auxiliary for the past two years. She is one of the Auxiliary’s youth volunteers and is going into grade 12 this coming school year. Her desire to help people within her community led her to volunteering. When she found out that the proceeds from the Thrift Shop support health care within the community, she felt it would be a good fit for her. When she began volunteering at the Thrift Shop, her first role was organizing the magazines and over time, she learned how to sort and price items. Sorting through the donations and finding interesting pieces soon became her favourite task. Mariya is also one of the summer student employees at the Thrift Shop this year. This is the second summer that she has filled this role. Mariya enjoys working with the other youth employees and the independence that she has gained within this position. After she graduates high school she is hoping to continue her education in digital design. In addition to volunteering, Mariya also enjoys drawing, photography, and doing activities that allow her to use her creativity. Mariya’s volunteer work also includes being a member of the Merritt Rotary Interact Club. She encourages other youth to volunteer as well, as she feels that it allows them to learn compassion, maturity, and communication skills. Mariya is a valued member of Auxiliary and her passion for volunteerism is appreciated by all. Volunteer story shared in August, 2015. Donna accepted some Valentine's Day treats from a very special customer at the Thrift Shop! Donna Chorney has been a volunteer with the Nicola Valley Health Care Auxiliary for over ten years. She was encouraged to get involved by her sister, long-time volunteer, Myrna Jones. Her daughter, Debbie, also volunteers with the Auxiliary at the Thrift Shop. Currently, Donna is one of the Thrift Shop’s Conveners, a role that she has filled for three years. While volunteering at the Thrift Shop, one of her favourite areas is arranging the table clothes and linens. Prior to her involvement with the Auxiliary, Donna was a long-term care aid. Volunteering has allowed Donna to continue working with members of the community, as well as continuing to support health care. She enjoys her time volunteering and appreciates the team spirit that the members have. One of Donna’s passions is country and western music. As a care aide, she was known for encouraging patients to participate in music, whether by playing an instrument, singing, or dancing. Every year in August, Donna hosts a gathering at her home, where dozens of people get together to play and listen to music. Donna is always there to help customers and volunteers at the Thrift Shop. They are drawn to her caring and giving nature and she is a very valued member of the Auxiliary. Volunteer story shared in June, 2015. Anne Rodschat has been a volunteer with the Nicola Valley Health Care Auxiliary for 42 years. She moved to Merritt from Germany 47 years ago and has become quite familiar with the community over the years. When she began volunteering she was a single mother with three small children. She started doing the children’s section at the Thrift Shop and enjoyed seeing customers coming in and getting something special for their kids. The smile on the children’s faces when they received something from the Thrift Shop always made her day. In addition to doing the children’s section, Anne has also been the Thrift Shop Convenor twice. She has seen the Thrift Shop evolve over time, moving locations and expanding its store space. Anne is very happy to see the growing support that it has received over the years. When Anne’s youngest daughter was 4 years old she would come to the Thrift Shop with her. Her daughter later became a hospital Candy Striper and then as an adult, began working as a nurse at the hospital in Merritt. Today, Anne’s daughter is a pharmacy manager in Seattle. It has brought Anne a lot of joy to see her daughter spending time at the Thrift Shop as a child and continuing her interest in health care as she grew up. Anne has contributed immensely to the Auxiliary in her time as a volunteer and her commitment is greatly appreciated. Volunteer story shared in April, 2015. Mother and daughter volunteers, Donna Vasko and Leah Hornby, have been with the Nicola Valley Health Care Auxiliary for the past few years at the Thrift Shop. Donna has been involved for four years and works on the Thrift Shop floor, helping customers and arranging merchandise. Leah got involved with the Auxiliary more recently, about two years ago, after hearing about the positive experience that her mother was having at the Thrift Shop. She now volunteers sorting merchandise and running the cash register. Donna inspired the value of volunteerism in her children at a young age. Leah has been involved with Girl Guides of Canada for over 30 years and continues to be a guide. Donna believes that there is a need for volunteerism in the community and hopes to see the Thrift Shop and its volunteer membership expand in the future so that they can continue to meet the growing needs for services in the community. Similar to her mother, Leah sees the value of volunteerism in Merritt. She encourages those that have spare time and are looking for something to get involved in, to consider volunteering with the Auxiliary. Even without experience working in a Thrift Shop or volunteering, one of the benefits is the training that is provided to new volunteers. Whether they are volunteering separately or together, Donna and Leah always bring cheerfulness to the Thrift Shop that is appreciated by customers and their fellow volunteers. Volunteer story shared in February, 2015. 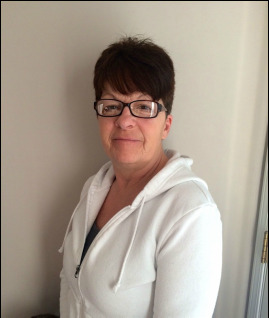 Kathy Parks has been a member of the Nicola Valley Health Care Auxiliary since 2013. As a newly retired individual who had recently moved to Merritt, she applied to be a volunteer as she thought it would be a good way to meet people and give back to the community. She began volunteering at the Auxiliary’s Thrift Shop two to three days a week, sorting donations and working with customers. She soon became responsible for one of the shop’s window displays, an exciting new challenge for her. She has found it to be very rewarding watching the display come together and it is something she looks forward to each week. Recently, Kathy has also filled the Volunteer Coordinator position with the Auxiliary. Within this role, she supports new volunteers throughout the application process. She helps them with the application forms, discusses the different volunteer positions that are available, and supports them to find a role that suits their interests. Kathy is also an avid thrift shopper, something that she frequently does with her grandchildren. Volunteer story shared in January, 2015. Judy Hughes has been involved with the Nicola Valley Health Care Auxiliary for two years and currently fills multiple roles. She began volunteering with the Coffee Wagon and continues to do so twice a week, serving coffee, tea, juice, and cookies to patients at the Nicola Valley Hospital and Health Centre. She enjoys interacting with the patients and feels that they appreciate the service provided by the Auxiliary. She also fills the 1st Vice President role on the Executive. Within this role she holds meetings when needed, steps in when the President is away, and supports the President in acting as a hospital liaison. Judy also volunteers at the Thrift Shop once a week. Judy thinks highly of youth volunteerism and her granddaughter, Laurenne Koller, is an excellent example of the contributions youth make to the Auxiliary. Laurenne is a volunteer at the Thrift Shop and was inspired to get involved from her grandmother. One of Judy’s fondest memories with the Auxiliary was attending a conference in Clearwater. During the conference there was a power outage and despite the lack of power, she found it to be a positive experience, throughout which, she was able connect with her fellow Auxiliary members. Volunteer story shared in December, 2014. Terry Flottvik has been a member of the Nicola Valley Health Care Auxiliary for just over a year, having joined in October 2013. Her connection to the Auxiliary began long before she became a member, as she has been an avid customer at the Thrift Shop for the past few years. She was asked if she would like to get involved as a volunteer, something that had not crossed her mind before. While it was out of her element and something she had never done before, she immediately felt comfortable on the other side of the counter, as a volunteer at the shop. Prior to living in Merritt, Terry was a commercial fisherman for about 20 years and she and her husband log salvaged. After one of her family members became terminally-ill, she moved from Vancouver Island to Fort Langley to provide support. It was at this time that she began advocating for increased availability of the benefits received under the Compassionate Care Act. Through her dedication to this issue, and aided by the support of Langley MP Mark Warawa, the benefit was changed in 2005 to allow the care-receiver to be able to name the caregiver of their choice. Terry has recently filled one of the two Thrift Shop Convenor positions. Within her role as the Convenor, she assists with the daily operations of the Thrift Shop and provides support to the volunteers. She believes that the Thrift Shop has an important role in the community and describes it as a meeting place, where customers come to unwind, take some time for themselves and see what special items they can find at the shop. Volunteer story shared in November, 2014. Betty Doberstein joined the Nicola Valley Health Care Auxiliary in 1981 as the Second Director on the Auxiliary’s Executive. At the time she was a stay-at-home mother and was looking for a volunteer opportunity that was flexible. She found this flexibility with the Auxiliary and it allowed her to continue volunteering when she began working full-time. Currently, Betty is the Auxiliary’s President, a position that she has held four times, each term for a period of two years. Within this role she runs meetings, organizes Auxiliary activities and events, and acts as the liaison between the Auxiliary and the Nicola Valley Hospital and Health Centre. In addition to volunteering with the Auxiliary, Betty has been the President of the Merritt Centennial Booster Club for 13 years and also helps out with Minor Hockey. Betty recently retired from her position at Gillis House and is looking forward to spending some time throughout the year down south in hotter weather. In the future, Betty looks forward to expanding the Thrift Shop and allowing for more items to be sold and more funds to be raised. Betty’s most memorable moment with the Auxiliary is when they burned the Thrift Shop mortgage, as a celebration for the members who had worked very hard for many years to pay it off! Volunteer story shared in September, 2014. Del has been a volunteer with the Auxiliary for over 26 years. Throughout her time with the Auxiliary she has held every position on the executive, including Convenor for the Thrift Shop. Currently she fills the Past President position. Through her commitment to volunteering and health care, Del has had a very positive impact in the Nicola Valley. In 2007, Del was one of five individuals nominated by the Nicola Valley Women in Action for her outstanding community service. Additionally in 2008, in recognition for her involvement in the health field, Del was chosen by Thompson Life magazine as one of the top 50 most influential people in the region. Over the years, Del has also been a committed volunteer for many other organizations and initiatives, including the Hospital Foundation Board, Patricia Rebecca Lodge, Merritt Senior Citizens Centre, Canadian Cancer Society, Big Bike for Heart and Stroke, Elvis Presley Fan Club for the Patient’s Transportation Program, Canadian Red Cross, and more. Jean became involved with the Auxiliary through Del. He is a helping hand around the Thrift Shop, working in the background, providing an extremely important service, moving heavy items and doing maintenance at the shop. Jean is joined by a few other men who fill a similar role. Jean is a musician that plays country music with a band locally at various spots within Merritt. Similar to Del, Jean is also involved in other community organizations. The Auxiliary is very fortunate to have Del and Jean as members. Their commitment and service to health care within the community is invaluable. Volunteer story shared in August, 2014. Tasha Zimmerman is an enthusiastic and devoted youth volunteer at the Nicola Valley Health Care Auxiliary Thrift Shop. At the Auxiliary’s Thrift Shop, Tasha can frequently be found managing the cash register, something that she greatly enjoys. It has given her an opportunity to develop her social skills and gain experience interacting with customers. Tasha is also active in other volunteer roles within the community. She has volunteered with the local soup kitchen since 2012 and more recently, became involved with the community food bank. She has recently finished grade 9 and looks forward to volunteering in the fall, as she enters grade 10. Following secondary school, she hopes to go into business and she sees volunteering as an important asset towards this. Tasha has a true love for music. She plays the trumpet and has participated in vocal jazz, community band, concert band, and jazz band. One of Tasha’s fellow volunteers is a very close family member – her mom - Heidi Zimmerman. Heidi fills the Publicity position on the Auxiliary’s Executive. She has been a great influence for Tasha, providing advice at the Thrift Shop. Tasha describes working with her mom as a lot of fun. One of the benefits of volunteering for Tasha has been the opportunity to get to know other individuals within the community – both youth and senior volunteers. Although the youth attend secondary school together, volunteering gives them the opportunity to get to know each other within a different setting. Tasha commented that, "Working with the Auxiliary has been great because I've gotten closer to my other youth volunteers"... Now that we work together we connect." Volunteer story shared in June, 2014. Kaitlyn Suzuki has been a volunteer with the Nicola Valley Health Care Auxiliary for over six months. Her grandmother, who has volunteered with the Auxiliary for many years, inspired her to get involved. After hearing a presentation at her high school this past winter from an Auxiliary member about youth volunteer opportunities, she decided to apply for a volunteer position. Kaitlyn has been an active volunteer within the community since she was in Grade 9, as it keeps her busy and is something she enjoys doing. In addition to the Auxiliary, she has volunteered with the Asset Committee, Smart Step, and Student Council. Kaitlyn is currently finishing Grade 12 and is looking forward to attending university next year, pursuing a degree in engineering. She is also a passionate artist who enjoys drawing and acrylic painting. Kaitlyn enjoys seeing the outcome of volunteering and knowing that the work that she did resulted in a benefit to someone or something. Volunteer story shared in May, 2014. Laurenne Koller has been volunteering with the Nicola Valley Health Care Auxiliary for the past six months in the Auxiliary’s Thrift Shop. In addition to volunteering with the Auxiliary, she also volunteers at the community library. She was inspired to get involved in volunteering by her Grandma, who is also a committed volunteer. Throughout her experience at the Thrift Shop she has developed her confidence and has become more comfortable interacting with others. Volunteering is an integral part of Laurenne’s future goals. She hopes to gain experience in preparation for post-secondary education, where she will pursue becoming a veterinarian. Already at the age of 13, Laurenne exudes dedication and passion towards volunteering. She speaks very highly of its value and hopes to see more of her friends volunteering and encourages them to do so. Volunteering at the Thrift Shop is a perfect fit for Laurenne, as she is an avid thrift shopper. Her suggestion for female thrift shoppers is to not be shy to check out the male section, where you can find great t-shirts, jackets, and jeans. Volunteer story shared in April, 2014. Lois Blair has been a dedicated volunteer for many years with numerous community organizations and causes. She began volunteering as a teen with high school sports and has since filled many different roles. Giving back to her community has remained an important part of her life. For the past three years, she has been involved with the Nicola Valley Health Care Auxiliary. She has always been involved in the health care setting, both professionally and as a volunteer, and being an Auxiliary volunteer was a natural fit. Lois is in charge of the Auxiliary’s coffee wagon, a service which provides juice, coffee, tea, and treats to hospital patients every afternoon at the Nicola Valley Hospital and Health Centre. Lois ensures that the supplies are stocked and overseas the training and organization of the coffee wagon volunteers. Lois has been personally impacted by the staff and services at the local hospital. After experiencing a heart attack in 2001, Lois is thankful for the care and dedication shown by the hospital staff and acknowledges them for saving her life. Following this experience, her perspective on life has changed. She now takes pleasure in each day, engaging in the activities she loves and continuing to give back to her community. She enjoys playing cards, gardening, swimming, bowling, and all around having fun. Volunteer story shared in March, 2014. 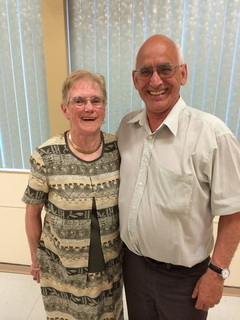 For 37 years, Myrna Jones has generously volunteered with the Nicola Valley Health Care Auxiliary. Throughout her time as a volunteer she has filled many roles at the Nicola Valley Hospital and Health Centre and the Thrift Shop. Myrna’s most prominent role has been at the Thrift Shop, organizing the weekly window display. Myrna has taken on this role for 35 years, always with great attention to detail. Her displays have brought many customers into the Thrift Shop. Looking back, Myrna has had many fond memories of her time with the Auxiliary. She had a few laughs at a provincial auxiliary conference, where her and a few members of the Auxiliary participated in a hay ride. But little did they know that once attached to the wagon, the horse team would take off running, with the members in tow. Myrna loves spending time with her two daughters, three grandchildren, and six great grandchildren. Her sister and niece are also members of the Auxiliary and she enjoys volunteering with them. Volunteer story shared in February, 2014. Joan Harkies has been a dedicated volunteer with the Nicola Valley Health Care Auxiliary for 46 years… and counting! She took a short break, moving to Revelstoke for a few years, but returned to Merritt and to the Auxiliary. She has filled multiple roles throughout her time as a volunteer, including volunteering at the hospital, the Thrift Shop, and for the gift case. She has always had a passion for volunteering and an interest in working with people. Having worked as a cashier, the Thrift Shop provided her with the opportunity to use her professional skills within a volunteer setting. Joan is the proud grandmother of five grandchildren. When she isn’t volunteering, she can be found on Nicola Lake, where she likes to go RVing and fishing. She also enjoys gardening, cooking, baking, walking, and has a love for dogs and cats. For six years, Joan and her husband have filled a unique role at the Thrift Shop, working on the jewelry that is brought in. They take the jewelry home to be cleaned and fixed, prior to being sold at the Thrift Shop. She hopes to see more youth volunteering in the future and welcomes their energy and new ideas. She also hopes to see more men get involved at the Thrift Shop to help with some of the heavy lifting! Volunteer story shared in January, 2014.